A flexible, relaxing five-day break where you can enjoy the magic of Disneyland® Paris and the charm of the City of Paris as you wish. Our Greater Paris hotels are well-situated to provide you with a low-cost break, with Disneyland® Paris and Central Paris both within a convenient coaching distance. 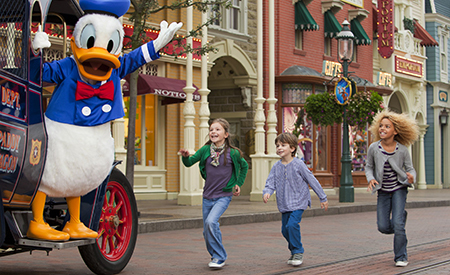 Our five-day Disney Experience is available during most of the school holidays! There is so much going on at Disneyland® Paris, with fabulous attractions and parades. On day two we include a magical full day excursion to Disneyland® Paris, including a Park Hopper Ticket plus return coach transfers. On day three, you can either choose a day at leisure or an optional full day at Disneyland® Paris. On day four, we offer optional transfers into Paris where you can spend a day sightseeing and shopping or why not explore the cosmopolitan City of Paris the easy way with our optional full day city tour and boat cruise? Day 1 - Paris. Relax onboard your Executive Class coach as you journey to your Channel crossing and then onto your hotel. Day 2 -Disneyland Paris. Included full day excursion with your included Hopper Ticket. Day 3 -Disneyland Paris. Day at leisure or join our optional full day excursion to Disneyland Paris. Day 4 -Day at leisure or optional transfers into Paris (£10 adults & £7 kids). Optional day time city tour and boat cruise. Day 5 -Journey home. En-route to the port, time permitting, you will visit a French hypermarket or wine/beer warehouse. Please Note: Rooms sleep minimum 2 persons, max 4 persons plus 1 infant. Child prices subject to sharing a room with 2 adults. Single supplement £99. Deposit £80 per person - Full payment due 12 weeks before departure. On day three why not add transfers and a Park Hopper Ticket for both Disney® Parks. Prebook this optional excursion for only £59 adults (£55 kids). Why not take in the stunning sights of Paris with a city tour and cruise? Prebook this optional excursion for only £29 adults (£19 kids). Return transfers into Paris only - £10 adults (£7 kids). It's flexible - Enjoy a great selection of cafes, fast food joints, and quality restaurants at Disneyland Paris. Meal vouchers are accepted in any of the resort's restaurants listed on your Meal Plan, for Lunch OR dinner. Meal means a starter, a main course, a dessert or an all-you-can-eat buffet + 1 soft drink. The Half Board Meal Plan is only £26 per adult and £13 per child per day and must be purchased for each day of your visit to the Disney Parks. Terms and conditions apply. You will stay for four nights at a hotel, such as, or similar to, the Kyriad Torcy. All hotels used have well-furnished en-suite bedrooms as well as a bar and restaurant where continental breakfast will be included. To book this offer, or for more information, just call us on 0800 849 1285, quoting reference number 225482.